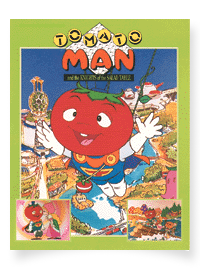 “TOMATOMAN and three Musketeers” will be aired in Spring 2015. The series consists of 26 episodes X 25 minutes approx. The Kingdom of Veegan is a beautiful dreamland where vegetables, fruits, nuts and insects to live together in peace and harmony. But, when a stormy weather roars in, the evil bugs are spawned in the swampland. Queen Bugfly believes she herself is the most beautiful in the world. Then, she hears the rumor that Princess Peach, the daughter of King Meloneous is prettiest girl in the country. Outraged , she casts an evil spell of eternal sleep on the beautiful Princess Peach, King Meloneous, the Good-heart, sends for "The Withered Plum," an old hermit and pleads to find a way to awaken the princess at all cost. "The Withered Plum" summands Tomatoman and his three mischievous buddies to get a drop of dragon’s tears…. A shy young tomato, he's transformed into a mighty knight. Not the brightest of boys, luck is usually on his side. A proud but stubborn young man. A mighty muscle-man. A woodsman by trade, even though he refuses to learn to climb a tree. A cynical and talkative guy with a bit of short temper. He has the secret purse full of thorns. He casts them to the enemy. A descendant of a warrior family. He put the red hood in fight. A mailman in regular life, he is very agile and skillful in disguise. Formerly a university professor, an inventor who creates strange machines that bewilder the other knights. A kindergarten teacher, she compels the other knights to line up every morning as if they were still children. A young, bright and cheerful little girl. These pea quadruplets travel together in a pea-pod boat. Together they comprise one knight. The jolly, good-natured ruler of the Veegan Kingdom. The kind beautiful daughter of King Meloneous, beloved by the entire kingdom. Tomatoman is her special favorite. The mentor of Tomatoman and three The wizard who created the Knights of the Salad Table. He travels on a flying leaf. A vain and selfish butterfly, she believes that she is the most beautiful woman in the kingdom. Bugfly's trio of villainous-looking and gluttonous bodyguards. They have infinite avarice on any food and never stops eating. Unlike their looks, they are gutless insects. Queen Badfly's greedy and treacherous butler. His ambition is to destroy the Kingdom of Salad. A monstrous creature who is a remote relative of Queen Bugfly. A dragon resides in the cave of Mount Jarapenyo. He befriends with Tomatoman later.